Regardless of the excitement generated by the World Golf Championships, the issue of who gets to play-or more importantly, who doesn't get to play-is a thorny question that needs to be resolved. The field of the other two WGCs (the Andersen Consulting Match Play and the American Express Championship) are determined by the Official World Ranking, a clunky system with numerous major flaws that results in the exclusion of many deserving players, while including (to cite the most egregious example) Jumbo Ozaki, who can't compete with the world's best players yet is still ranked 15th in the world. But the NEC Invitational didn't use the World Ranking to determine its field; instead, it invited the teams from the 1999 Ryder Cup and 1998 Presidents Cup. Hard to criticize that format, right? Wrong. First, the $5 million purse was considered official money on both the PGA and PGA European Tours, and the tournament awarded a huge amount of World Ranking points: From 68 to winner Tiger Woods down to two to last-place finisher Joe Ozaki. Sixty-eight points is more than the winners of most PGA Tour events get, twice as many as the winner of an average European Tour event receives, and nearly equal to the amount the winner of the The Players Championship collects, an event which annually attracts one of the strongest fields in golf. That's outrageous. The NEC Invitational had 41 players and no 36-hole cut. Such limited field, no-cut events always look, feel and play more like exhibitions, not competitions. In this case, the event was actually a payback to appease the players who didn't get paid to play in the Ryder or Presidents Cups. That's all fine and dandy-as long as you don't count the purse as official money and don't hand out World Ranking points. If you do, you're penalizing a lot of world-class players who aren't there and rewarding a lot of questionable ones who are. The most obvious examples are the wild-card picks, the players who didn't earn their spots onto the Ryder and Presidents Cup teams, but instead were picked by the captains. For example, U.S. captain Ben Crenshaw recently filled out his team with Steve Pate while passing over Bob Estes, who finished 11th on the Ryder Cup points standings. European captain Mark James selected Andrew Coltart at the expense of Robert Karlsson (who, like Estes, finished 11th in the European standings). For the next two years, Pate and Coltart get two great opportunities to earn money and World Ranking points (remember, as members of the '99 Ryder Cup teams, they are eligible for the 2000 NEC as well), while Estes and Karlsson don't. That hardly seems fair. What's worse is if the format allows a struggling player to maintain his exemption-but that's what might happen with Frank Nobilo. The New Zealander began last week ranked 157th on the 1999 PGA Tour money list and 183rd in the World Ranking, with just one top-20 finish all season and no wins of any kind anywhere in the world since the 1997 Mexican Open. His biggest concern is keeping his PGA Tour card for 2000. 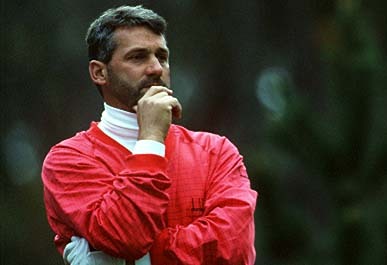 Yet there he was at Firestone, courtesy of Peter Thomson, who chose him as one of his captain's picks for the 1998 Presidents Cup International team. Had Nobilo been lucky enough to win the NEC and collect the $1 million first-place check, he would have moved as high as 16th place on the money list. Eighteenth or better would have put him into the top 125. As it was, he finished 38th and earned $30,000 and moved up to 145th, putting him that much closer to keeping his exempt status, while earning valuable World Ranking points that may help him get invited to a future major championship or WGC event. Meanwhile, the No. 3 money winner on this year's European Order of Merit, South African Retief Goosen (54th in the World Ranking), and the No. 7 money winner, Argentine Angel Cabrera (who is 61st), weren't eligible for Firestone because they weren't lucky enough to be chosen by Thomson. During a press conference at Firestone last week, PGA Tour commissioner Tim Finchem said that the addition of the World Golf Championships increases 'the number of events that impact the World Ranking and, we think, make the World Ranking even more credible.' I say that Finchem is dead wrong. The World Ranking is a mess-and the World Golf Championships are just making it messier. Dean Knuth, former senior director of handicapping for the USGA and a contributing editor to Golf Digest, wrote 'Rankled by the World Rankings' in the magazine's April issue. Copyright � 1999 The New York Times Company Magazine Group, Inc. All rights reserved.